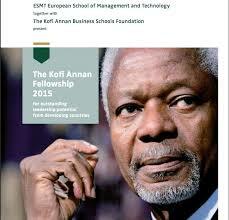 Kofi Annan Fellowship support is currently open to eligible applications. This Fellowship provides the opportunity for talented and motivated students from developing countries, who do not belong to a privileged class and lack sufficient financial means, to study management at the European School of Management and Technology (ESMT) in Berlin and graduate with a prestigious MBA or MSc from the most international business school in Germany. ESMT’s one-year Full-time MBA program is a management acceleration program aimed at early to mid-career professionals with at least three years of professional experience. Note: After graduation, fellows are expected to commit to returning to their home countries or regions to participate for at least three years in the development of the local or regional economy. Assistance with placement will be given by ESMT. MBA applicants should have a bachelor’s degree of any kind, a minimum of three years of professional experience, GMAT, and proficient English skills. All applicants should have a willingness to contribute to building the economy and society of their home country with entrepreneurial impetus. € 58,000 and covers full tuition fees and course materials in addition to a living stipend of € 1,000 per month for the duration of the MBA program. The fellowship also covers one round-trip plane ticket to Berlin from the Fellow’s home. Fellowships can be awarded only after a candidate has been admitted to the ESMT MBA program (i.e., applicants must also complete the online application before being considered for a Fellowship). Visit the European School of Management and Technology, to learn more about their full-time MBA program. Applications are only accepted online via ESMT’s website. Potential applicants may also submit a CV for a preliminary check to determine whether they are eligible to apply. For more information, visit the Kofi Annan Fellowship Or send questions to admissions.degrees@esmt.org, or contact the admissions team at +49 30 21231 1400.